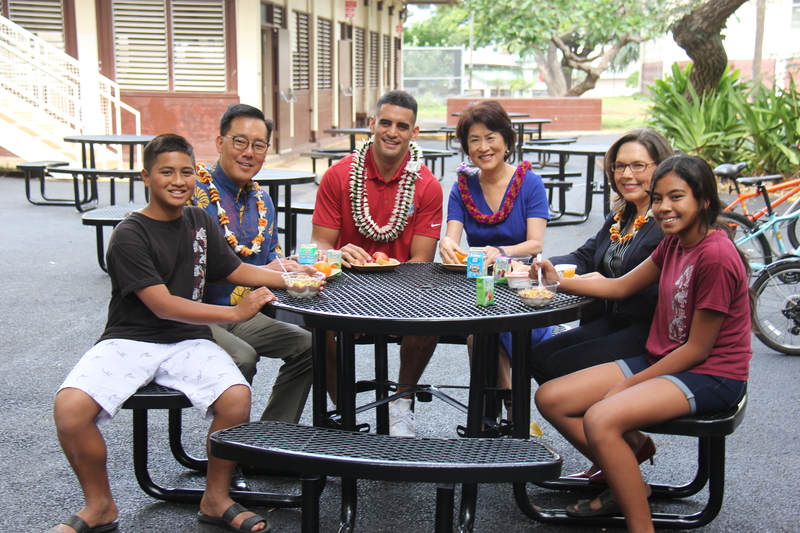 First lady and Marcus Mariota in the courtyard with (from left) Chrisciah Keawe, Keith Amemiya, principal Anne-Marie Murphy and Kanani Kanewa. The “Jump Start Breakfast” pilot program being launched at up to 10 Hawai‘i schools has itself been jumpstarted by a $60,000 grant from the national No Kid Hungry campaign. Other community non-profits such as Hawai‘i Appleseed, the Safeway Foundation and the Albertsons Foundation are also supporters. In addition, Governor Ige has declared March School Breakfast Month to highlight for families the student benefits in improved health and academic achievement. According to Dexter Kishida, a DOE food services supervisor, the goal of the campaign is to increase the average daily participation in school breakfasts at the pilot schools by 1,100 meals. Kishida said the schools in the pilot program will be trying different approaches to increase participation, such as “grab and go” items students can eat on the run or breakfast in the classrooms. The pilot schools include Hawai‘i island – Hilo Union Elementary, Kapi‘olani Elementary, and Waiākea High; Leeward district – Ewa Elementary, Leihoku Elementary, Wai‘anae Elementary and Intermediate; and Honolulu district – Central Middle, Fern Elementary, Linapuni Elementary.